It was move-in day on Friday 31-March! I got the call from my supplier (Dale Wolf) on Thursday afternoon, that Dale was arriving back in Baldwin a day or so early. We were supposed to pick up the packages of bees on Saturday, but this early alert changed my plans for Friday and Saturday. Changed my calendar to read “Playing Hooky”! We headed over to Baldwin, Wis (19 mile marker from the border with Minnesota on I-94), and got to Wolf Honey Farm around ten AM. Signed in with Dale’s wife Joyce, and then went out to Dales’s truck, a 20′ box on wheels, full of packages of bees. Dale is third-generation honey farmer, so he’s been doing this for a while. 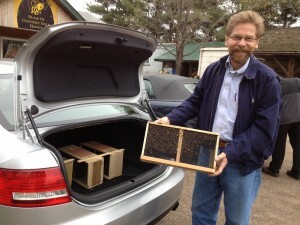 And he makes two trips per year in the spring to pickup packages of bees in Georgia to haul back to Wisconsin. The bees were pretty docile this morning, since the temperature hadn’t gotten up much past 40F. They had only been in the package since Wednesday sometime and had only known this queen for a couple of days. And here’s your host, with a 3-pound package loading the Audi. There are four packages already in the trunk, and five 3-pounders adds up to about 85,000 bees (5700 per pound, three pounds per pkg, 5 pkg)…That’s a lotta bees. We were expecting to pick up 8 packages in total, but we had a tentative agreement for three hives fall through. So we picked up 5 packages today, and will get 3 more in a couple of weeks, when Dale comes back with another truckload. Stopped over to see my Mom, to show her what these bees looked like when they’re ready to load into the hive. Since she had been out to visit “the girls” last summer, I thought she’d like to see a fresh package before they were hived.